Does the Hive Practice What It Preaches? Ke Xin, an employee at the Hive, still has faith in what the café is trying to do. Only in its third year of existence, the student-run organization located on both Concordia campuses has hit financial snags in the past year, but has maintained a reputation as a progressive alternative to places like Tim Horton’s or Java U. The Hive’s vision of creating an inclusive and accessible food system has measurable support, with over 4,000 registered user-members in its solidarity cooperative business structure. Despite remaining faithful towards the café, Xin also said they’ve become disillusioned with it. A second-year Concordia student, Xin currently works as a barista at the branch on the Loyola campus and sits on the Board of Directors as a worker-member. They say the Hive management and staff lack racial diversity, calling for the organization to practice affirmative action in its hiring practices. There are only two people of colour working at the Loyola Café, said Xin—a space that they haven’t felt safe working in. Xin said this stems from an incident that happened the day after the U.S. Presidential Election. It was Nov. 9 and Donald Trump was the president-elect. Xin, an American with family in the States, says they saw someone wearing a “Make America Great Again” red cap in their class. They were at work talking with a coworker about seeing this Trump supporter. A customer the two were serving overheard their conversation and began arguing the merits of freedom of speech, saying that they can’t silence people’s thoughts and opinions. As the customer continued to push the unwanted argument, Xin began crying and had to be taken outside by their coworker, while someone else finished the transaction. Worried about returning to work in the coming days, Xin emailed the Hive’s Board of Directors explaining the incident, and asked that a poster they made be put up in the café. In their email to the Board, Xin asked for thoughts on the poster and when it could be hung up so that they could feel better about returning to work. “Dismissed” and “disempowered” are the words Xin uses to describe how they felt about the email responses they received. In the email thread, two people replied—a Board member and one of the café’s coordinators. They explained to Xin that they should file an incident report with HR, that the Board would decide on the poster, and that the Hive doesn’t take political stances. As well, they told Xin that a private ad-hoc committee had been formed to discuss the matter. “It would be addressed in all this bureaucratic speech which is super frustrating because it’s not accessible,” Xin said. The US election became a moment of crisis for people of colour, said Xin, a queer trans person of colour. Displaying the sign was vital to showing solidarity with the movement against Donald Trump, and protecting user- and worker-members, Xin tried explaining over email to their peers. “It crushed a lot of my dreams because I really believed in this café when I started working there,” they added about how members of the Hive responded. “Being myself and being from a marginalized community wasn’t enough,” Xin continued about the general inaction of the Board and coordinators. 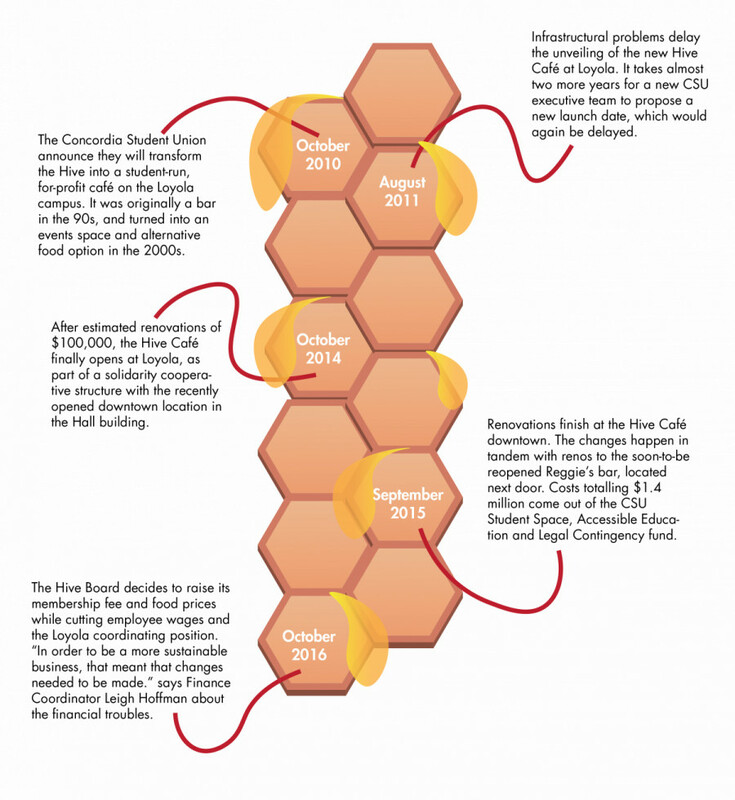 A history of the Hive. Graphic by Kelsey Litwin. Ben Prunty, the Board member who responded to Xin’s first email, declined to be interviewed for the story. “These matters have been handled months ago with multi-stakeholder representation through the Hive’s internal processes and include information that is inappropriate to divulge publicly,” Prunty wrote in an email. It’s been over four months since the Hive created an ad-hoc committee to address Xin’s request, and a new safer space poster still hasn’t been put up in the cafés. The new sign is being finalized and should be ready for approval shortly, said Leigh Hoffman, the finance coordinator of the Hive. 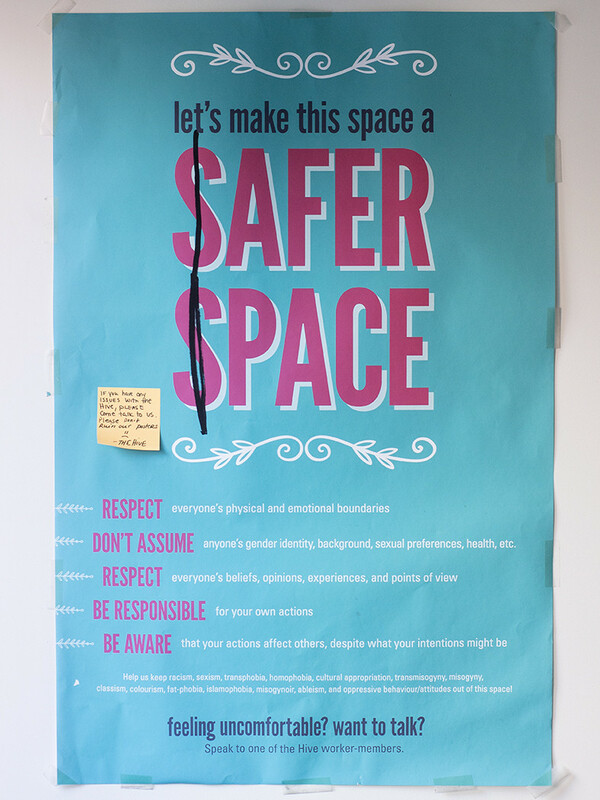 The Hive already has a safe space poster displayed in each café, Hoffman explained, but this new one will be revamped to empower employees to intervene in situations of harassment. The reason it’s taken so long to formally address Xin’s concerns, they said, is because the decision had to go through due process of the Board, and that the Hive operates under a multi-stakeholder mandate of its customers and workers. “History has shown decisions made out of a sense of urgency don’t hold the long-term goal of nuanced multi-stakeholder perspectives,” Hoffman said about not taking immediate action following Xin’s email. They added that Xin has been invited to join the meetings of the ad-hoc committee but didn’t attend them. Paige Hilderman, the events coordinator of the Hive, said that if Xin wanted to, they could’ve brought their zero-tolerance poster to the Concordia Student Union, had it officially stamped and approved for display, and hung it up in the Café themselves. A 24-hour emergency Board meeting should have been called, Hilderman continued, and a public statement possibly should have been made condemning what happened to Xin. The Hive as an organization has taken political stances in the past and hung up banners to demonstrate this. On April 2, 2015, the worker-members of the Hive went on strike to protest provincial austerity measures alongside thousands of other striking students. At a Hive Board of Directors meeting on Dec. 5, 2016, they approved a request to hang up banners made by Divest Concordia. Another Board member, Maidina Kadeer, wrote a statement explaining that the Board has recognized Xin’s concerns as legitimate. “With this, we have taken extra measure, and continue to do so both within visual indications of safer space policies, and worker/worker-board/board communication, in order to ensure that both workers and customers feel safe in our location, and when engaging with other members,” they wrote. Zaya Solange was one of Xin’s coworkers who intervened in the incident with the customer the day after the elections. She’s been working at the Hive since September of last semester, but worked her final shift last Thursday. She left due to personal reasons but adds that she never felt welcomed or supported at the café. “I definitely enjoyed it a lot in the beginning especially compared to other jobs,” she said, mentioning the diversity amongst the staff, in terms of gender identity and sexual orientation. Solange says she began feeling singled out at the café after experiencing microaggressions from some coordinators, who act as the managers and administrators of the Hive. One example, she recounts, involved a coordinator randomly asking her what the term misogynoir meant. Solange, a Black woman, explained that misogynoir is a term used to describe the forms of racialized misogyny that Black women specifically face. “Oh, that’s what I thought,” is what Solange remembered the coordinator saying before walking away. Rather than begin a dialogue about misogynoir, all that interaction did was remind her about the oppression she experiences on a daily basis, Solange said. If she was a barista working at a Starbucks, she added, then she would expect this type of behaviour. But not at the Hive, which states it’s an anti-oppression organization in its bylaws. During this past winter semester, Xin took time off of work for personal reasons, but has since returned. They haven’t been to a Board meeting in a while, but they said they plan to return soon. Changes Xin wants to see at the Hive include addressing the imbalance of power between the Board and worker-members. “It doesn’t allow new people to enter with new ideas,” Xin said.